Digitally stored at Kazerne Dossin. The original suitcase was donated to Kazerne Dossin. Marion Finkels-Kreith was one of the survivors whose story was included in the Cuba's Forgotten Jewels documentary film (see collection KD_00527) . See also the Fischler-Hollander collection (KD_00315) for more information on Marion's friend from Cuba Abraham Aron alias Bram Fischler. Marion Finkels was born in 1927 in Hamburg, Germany, as the daughter of John Finkels (officially Samuel Finkels) and Rose Herzog (officially Rachel Herzog). John’s parents had emigrated from Poland to Germany and owned a small department store in Altona, a suburb of Hamburg. After Marion’s grandfather passed away, John took over the department store which was in fact run by Rose. In 1933 the family moved out of the house of Marion’s grandmother Bertha Finkels and into their own apartment far away from the Jewish neighbourhood. The family was not very religious and only went to synagogue from time to time. When Jewish children were expelled from school in Germany, Marion was sent to a Jewish school thirty minutes from her house. During the walk, other children sometimes would harass her, even throwing rocks at her because she was Jewish. Due to Shabbat, Marion had to go to school on Sundays instead of Saturdays. To avoid standing out and attracting unwanted attention, Marion hid her school books in a small suitcase. Marion’s Uncle Joe, owner of the Lindor hosiery stores, migrated from Germany to Belgium in the mid-1930s . He would help many Jews to flee Europe the following years. Marion’s grandmother Bertha also left for Belgium to join her daughter there. At the time, Marion went to a Jewish high school in Hamburg. Many of her friends started to emigrate due to the anti-Jewish laws in Nazi-Germany. In the late Fall of 1938, Marion’s father John left for Belgium after receiving an invitation from Uncle Joe. 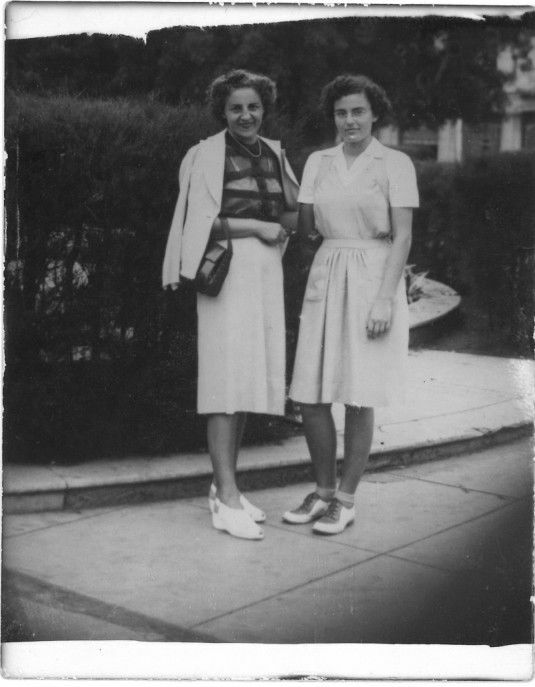 Marion’s mother Rose and both daughters stayed behind to clear out the apartment and then also left for Belgium. Upon arriving in Belgium, Marion, her parents and sister Ada moved in with their uncle Joe at 124 Avenue de Tervueren in Woluwé-Saint-Pierre, Brussels. Late in 1939, Joe and his family left for Canada leaving the Finkels to live in their house. Marion visited a local school and learned French. On 10 May 1940, Nazi-Germany invaded Belgium. German refugees were ordered to register at the municipality. Marion’s father went to the town hall, but was arrested and deported to southern France. He was first detained at the Saint-Cyprien camp. In October 1940 he was transferred to the Gurs camp and was then taken in 1941 to Les Milles. Meanwhile in Belgium in May 1940 Monsieur Lonnoy, a friend of Uncle Joe, lent Rose his car to try to escape the Germans and flee to France but they could not the cross the border and ended up in La Panne at the Belgian seaside. Marion, her mother and sister survived a bombardment and, after the arrival of the German troops in La Panne, returned to Brussels where they found Uncle Joe’s house occupied by the Germans. Rose found a small apartment for her and her daughters. Marion then finished her last official school year in Belgium. It was not until the Summer of 1941 that contact with John, still in France, was re-established and the family finally learned about his whereabouts. They also learned that Uncle Joe had been able to obtain visas to Cuba for John and the family. Marion, her mother and sister were smuggled out of Belgium. They illegally crossed the demarcation line near Bordeaux and were re-united with their father and husband in Marseille. They travelled together via Spain to Portugal from where they sailed to Cuba in November of 1941. Marion and her family built a life for themselves in Havana where they were members of the Jewish refugee community working mostly in the local diamond industry. Marion made many friends including Bram Fischler, Esther Birnbaum, and twins Slom and Lilly Birnbaum. In 1946 the Finkels family migrated to the United States where Marion became a French teacher. She started a family, has children and grandchildren. When fleeing to Cuba in 1941, Marion's family took with them a small suitcase. Marion has kept the suitcase her entire life, as well as her diary and photo album from her time in Cuba. In 2019 she kindly donated the original suitcase as well as copies of several photos and documents from her archives to Kazerne Dossin, during a visit of her daughter Judy Kreith to the museum.